If you know me very well, then you know of my passion and love for Israel and the Jews. It’s not always an easy passion to have. I spend a lot of time trying not to be ticked off at the rest of the world. It happened last summer. A boatload of idiots, aka activists, tried to enter into Israel illegally through a port. The “activists” claimed to have a load of supplies for the starving and neglected people of Gaza. (Never mind that it is documented that Gazans receive more aid per month than any other people in the world. But hey, those kind of facts tend to ruin propaganda.) The IDF soldiers warned the boat to halt. It did not. Soldiers boarded the boat to stop it. Soldiers got beat up. And the world cries “Foul!” Against Israel, of course. "Since 1948 Arab leaders have approached the Palestine problem in an irresponsible manner. They have used the Palestine people for selfish political purposes," King Hussein, 1960. "There are no differences between Jordanians, Palestinians, Syrians, and Lebanese. We are all part of one nation. It is only for political reasons that we carefully underline our Palestinian identity . . . yes, the existence of a separate Palestinian identity serves only tactical purposes. The founding of a Palestinian state is a new tool in the continuing battle against Israel," Zuhair Muhsin, member of the PLO Executive Council. "Why is it that on June 4, 1967 I was a Jordanian and overnight I became a Palestinian? We did not particularly mind Jordanian rule. The teaching of the destruction of Israel was a definite part of the curriculum, but we considered ourselves Jordanian until the Jews returned to Jerusalem. Then all of the sudden we were Palestinians. They removed the star from the Jordanian flag and all at once we had a Palestinian flag," Walid Shoebat, former PLO terrorist. World governments join in the charade, as sadly do Israeli leaders. For decades other nations have promoted peace summits where Israeli leaders sit with terrorists at the negotiating table. On the table is the following plan: Israel gives land to Palestinians. Palestinians stop killing Jews. The plan carried out results in: Israel giving away land. Palestinians continuing to kill Jews. Hence the plan is pushed even harder. So, Israel continues to give away land. Palestinians continue to kill Jews. See a pattern? The peace process is a charade to destroy Israel. Any semi- intelligent person knows this. Arafat was offered Palestinian statehood. He turned it down. The on-going conflict is not about geography. The fact that Israel exists is the real conflict. As former Egyptian President Nasser said, "The existence of Israel is in itself an aggression . . . an aggression against the Palestinian people." Nothing has changed in that regard. Beginning in the 1920's, the Grand Mufti Amin al-Husseini, who had deep ties with the Nazis, was the driving force behind opposition to any Jewish presence in the land of Israel. He set the stage for all resistance to Jewish self-governance in Israel. His tactic was known as the "Diplomacy of Rejection." It is now called the "Peace Process." The “Peace Process” has become so en vogue that it has emboldened those who are against the existence of Israel. Sure, the Jewish haters use clever tactics to destroy Israel, nevertheless that is their goal; to destroy the Jewish state. College professors at esteemed campuses such as Harvard, Princeton, Penn State, UC Berkeley, and many more teach against the state of Israel via the Boycott, Divestment & Sanctions against Israel. Entire seminars are devoted to “Israel Apartheid Week” on college campuses thanks to the nut job Jimmy Carter and the so-called spiritual leader Desmond Tutu. A Penn State professor went so far as to teach a seminar on how to teach against Israel, even when your class is not about Israel. Brilliant, huh? I have a friend who goes to Texas Tech, right smack in the Bible Belt. But even one of her professors found the occasion to slip in anti-Israel propaganda. And of course, our government continues to put the blame of unrest in the Middle East on Jews building homes on Israeli soil. Never mind that Palestinians build suicide bombs. Never mind that Palestinians continue to launch thousands of missiles against Jews. Never mind that Iran, who maybe is or maybe isn’t building a nuclear bomb (yeah right!) has professed it’s desire to, “Wipe Israel off the map.” It’s the Jews who have the audacity to pick up a hammer and build who are the main obstacle to peace. In other words, it’s the "damn Jews’" audacity to wake up every morning and breathe that is the main problem. Which brings us back to the march against Jerusalem. 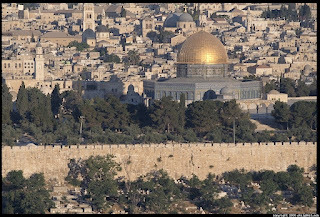 Jerusalem, which just happens to have been the Jewish capital for around 3000 years, give or take a few. (Watch and read the US State Dept. Spokeswoman whose policy is not to utter the words that Jerusalem is the capitol of Israel.) Jerusalem which wasn’t even mentioned as a ultra-holy place for Muslims until suddenly an undying passion for Jerusalem among Muslims conveniently helped the Palestinian cause. There are Jews who literally love Jerusalem with every fiber and cell of their being. And then you have the other side, those who fake a passion for Jerusalem, who are aiding and abetting the cause to take Jerusalem away from the “Judaizers.” Those with this faux concern for Jerusalem include such “esteemed” people as Rev. Jeremiah Wright, Code Pink, Rabbi Lynn Gottlieb, Cindy Sheehan, Richard Falk and Noam Chomsky who have all endorsed the march to liberate Jerusalem. Basically a Who’s Who of the rabble trying to destroy a Jewish State through the modern warfare tactics of propaganda and intellectualism. The only place I know to turn to counter the stupidity of the bias against Israel is to the writings of the Jewish Prophets. The Prophets envisioned a time like we are living in. 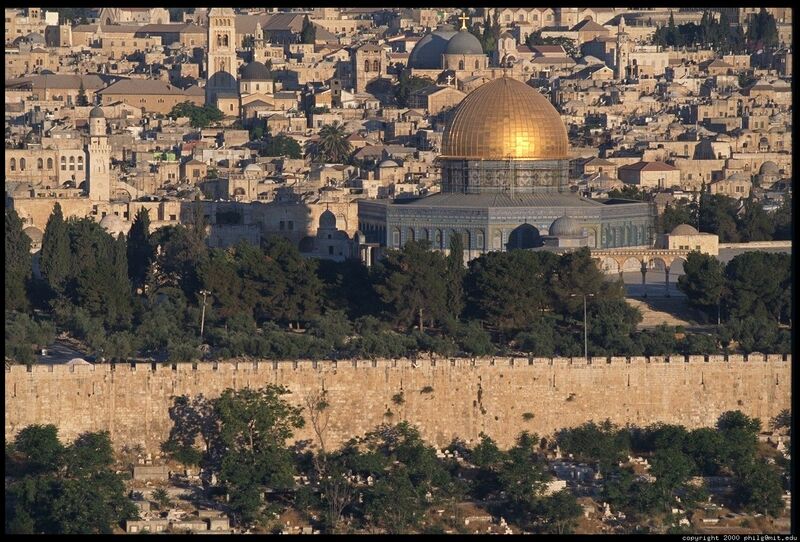 A time when the entire world would turn against Israel and more specifically against Jerusalem. The scenario described isn’t pretty. But at least it has a good ending. If you are on the side of the Jews, that is. Well, let me take that back and put it another way. It has a good ending if you are on the side of the God of Israel. But still, it’s not going to be pretty. Yet. Camie, this is a grand-slam home run column! Too bad more Jews, and Israelis, don't see things even half as clearly as you do.